During the summer, a week long celebration takes place with a variety of events taking place. 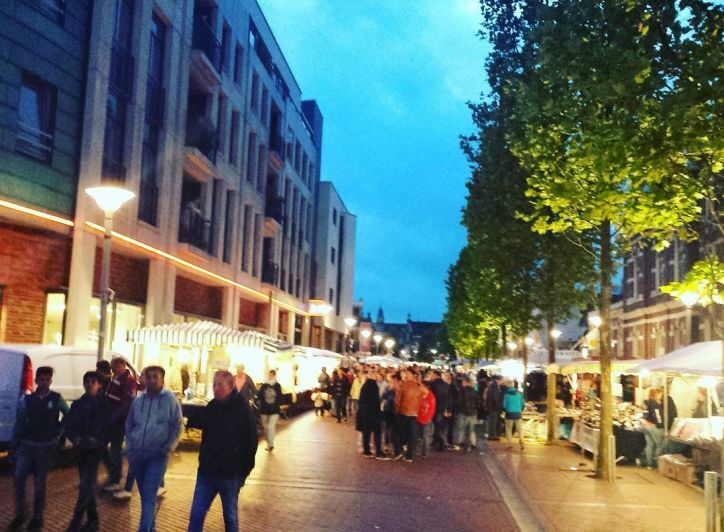 The Nacht Van Winschoten is the first of these main events. The second is a dancing night (primarily with djs and loud wub wub music) and the third is for children. Since the first event interested me the most, I wanted to spend some quality time there this year. 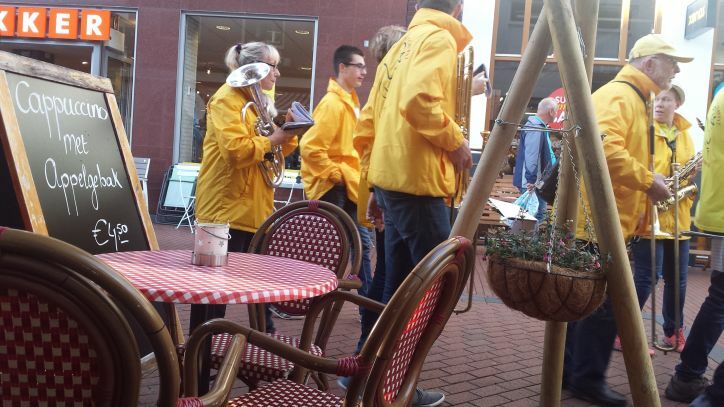 This blog will talk about what me and my family did during Nacht Van Winschoten! My partner and me decided it would be incredibly fun if we went to the Nacht Van Winschoten with his parents. Definitely a good choice, since they are super fun to be around. We decided that before heading into the event, we would stop off somewhere first to get a drink and a snack. Once the decision was made, we headed off to the shopping street. 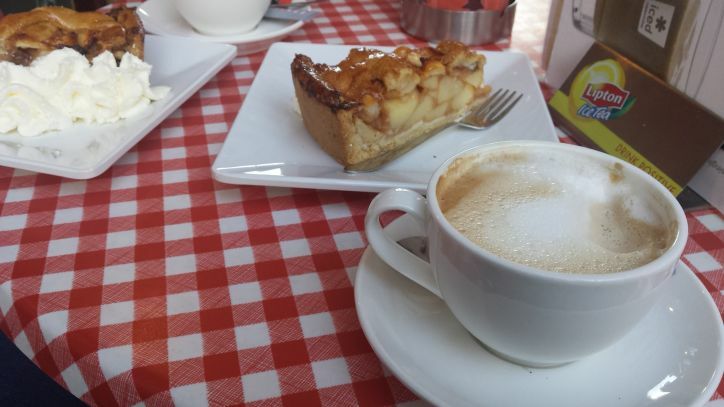 Cappuccino and apple pie! Tasty. Shockingly, it wasn’t too busy here. Made sense since the Nacht Van Winschoten was just a little bit further in than here. There were a variety of cafes to choose from, but we went with our usual spot, Paninis. This cafe is one of my favorites because it’s nice and central and the beverages are delicious. We all decided to have cappuccinos and apple pie. As always the cappuccino did not disappoint. Super tasty with a lovely froth, just what I want from my drink! The apple pie was also delicious but I personally could not finish it. My partner had no problem finishing it off though! The marching brass band passing by. Sitting at Paninis was rather exciting during the Nacht Van Winschoten. Not only did you have the normal shoppers passing by, but all around you you could hear music coming in waves. At some point, even a marching brass band passed us by. Super awesome to watch! After everyone had finished their drinks, it was time to head over to the main area where the Nacht Van Winschoten was taking place. The entrance to the carnival section. The first proper stop that we took was the carnival. The carnival was part of the week long celebration, not really related to the Nacht Van Winschoten. 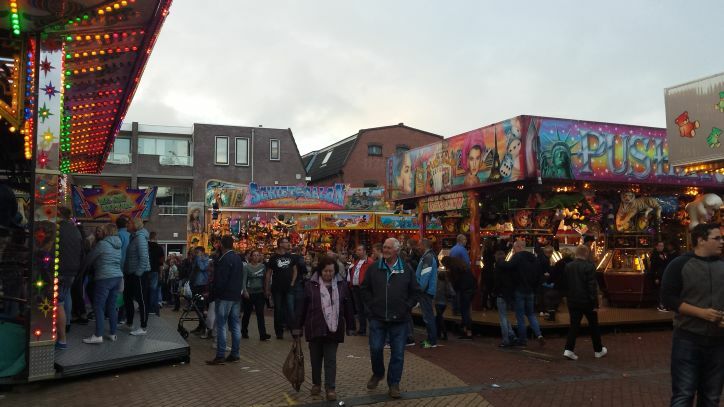 The carnival – or Kermis – had a huge selection of arcade machines, stalls with games as well as rides. 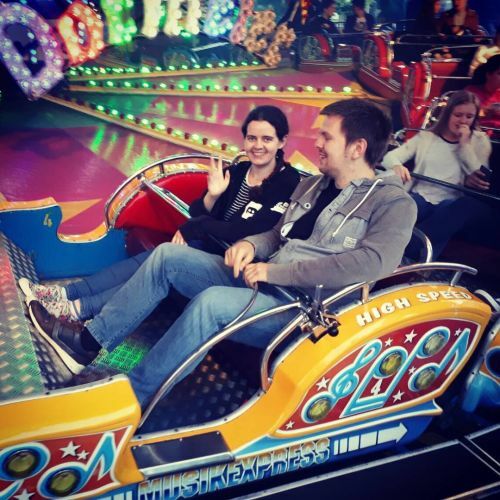 I have always enjoyed going to carnivals while growing up, so Kermis was excellent. We didn’t really do a whole lot of things at the carnival, but it was enjoyable to watch people going on the rides and looking at the arcade machines and pretty lights. My partner and me on the ride. Look how happy I am! But I did want to do something. I refused to go anywhere further until I went on one of the rides. They had 2 main rides going at Kermis. One was the ride that goes up and down in a circle super fast, and the other was situated on the ground but would bump up and down and go round at an incredible speed. That was the one I wanted to go on. Reluctantly, my partner agreed to come on this ride with me. We paid and waited to get on. What I loved about this ride was not only the adrenaline rush that it gave me, but the fact that my mother and father-in-law enjoyed watching us have fun. They even managed to take some pictures of us on the ride. I loved one picture in particular because you could just see how happy I was to be on it! After the ride was finished, we headed off to look for a potential “carnival” snack, and that came in the form of REALLY BIG STICK OF COTTON CANDY. The cotton candy stand. 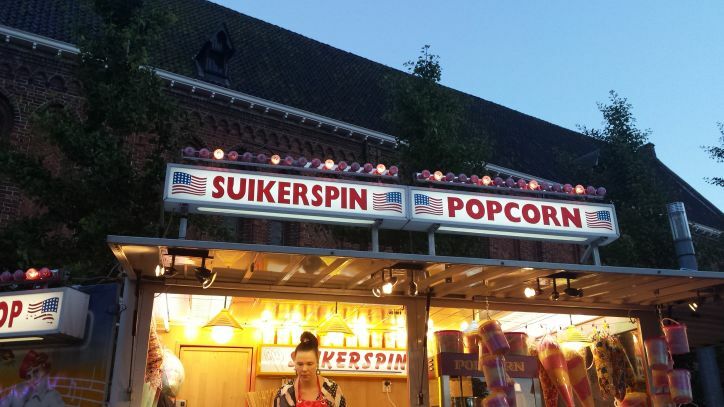 Or Suikerspin in Dutch! As with any festival, a good selection of food was available, as well as drink. 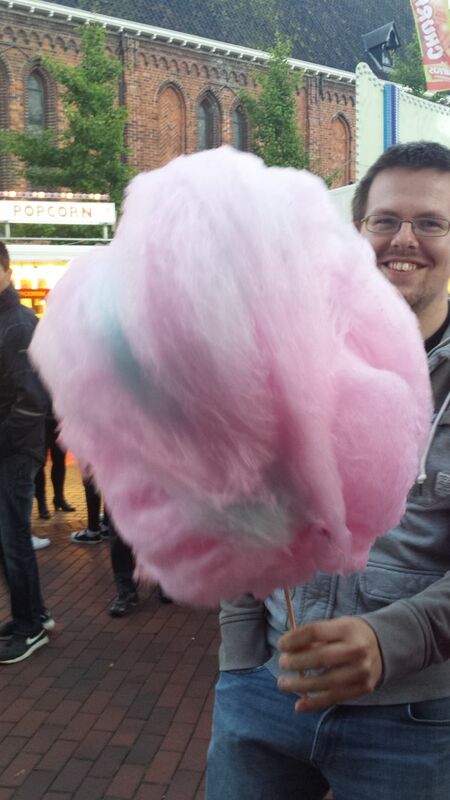 But what ended up being the main “food” of choice for my partner was the biggest stick of cotton candy I think I have ever seen. It was MASSIVE. I don’t even think I can describe with words just how big it was, so the picture below should be able to put into perspective just how huge this thing was. Seriously, LOOK AT BIG IT IS! Did my partner want something this big? Not at all. What he wanted was a “turbo” stick of cotton candy. He decided to get this size because the little girl in front ordered the same. The woman behind the counter made up the stick and handed it to her, and he thought, “Oh that’s not too big, I’ll go with the same.” Turns out, that was a mistake! When it was his time to order his cotton candy, he asked for the turbo. The woman then proceeds to pull out the BIGGEST stick she could find and started to weave the magical sugar around. She kept piling and piling it on, and we could not stop laughing. People were staring thinking “holy crap that’s big”. They did manage to eat the majority of the stick, but left some and just binned it. 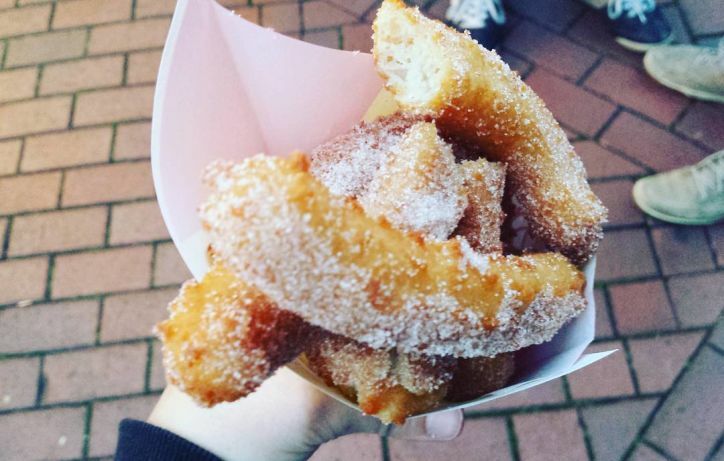 My little bag of sugary churros! Since I couldn’t have any of the cotton candy due to it being made of PURE SUGAR, I opted to order a little bag of churros from the food truck next to the cotton candy stand. They were delicious and warm and super light. I did decide to get some sugar sprinkled on top of them, but next time I would opt out of the sugary dusting. The main stage area where we hung around at. Around the Nacht Van Winschoten, there was several music locations to chill at. Some with music playing from a cd over loud speakers, others with a proper DJ performing. But the music stage that we decided to linger about at had a proper musician singing and performing. The area was absolutely packed with people enjoying the music and drinking. Since we would be here for a little bit, we decided to get a drink. Alas, I would not be able to have anything alcoholic since my stomach would hate me, so I just went with water. My mother and father-in-law went with beer, and my partner went with cola. It was really satisfying to just stand around and chat, listening to the music and the banter of the people surrounding us. Everyone was having a great time, as were we. 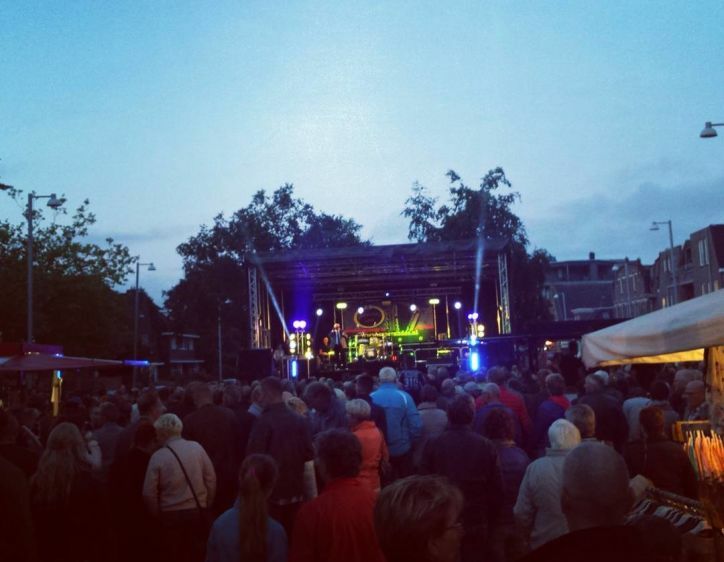 I do wish I was more of a festival goer, because the Nacht Van Winschoten would be going on until 6am in the morning. We were only there for roughly 2 hours before we decided to head home! But we weren’t going to go home without visiting the final part of the event. The market street. Final picture of the night – the Market. Look how beautiful it is! To me, the market was utterly brilliant. But according to my mother and father-in-law, this market used to span the entire length of the street and then some. What I saw was only a small portion of what it used to be like. Regardless of this, I thought it was rather beautiful. Especially at night with the darkness creeping in and the lights flicking peacefully. Most of the stalls were only selling clothing, hats and toys. Some had some hand-crafted jewelry too which looked stunning. We had a little look through some but nothing really caught our eye. The market was going to be our last stop of the evening. Once we finished walking down the length of the street and exited the market, we headed off back home. I always love an excuse to go out. The Nacht Van Winschoten did not disappoint! I absolute adored being among everyone who attended the event. Being able to stay for a decent amount of time this year was also great. It allowed me to get a better feel for the evening that previous years, and take more pictures! This would be a night I would happily take my friends and family to. I am sure they would enjoy all of the music, the market and the carnival attractions! Going to the Nacht Van Winschoten reminded me of the days where I used to go to different arcades by the beach and carnivals that would pop up every so often. These provided great memories of spending time with my nana, my sisters and my family and friends. Now I am making new memories that will last a life time! Have you ever attended a local festival? Do you like carnivals? Tell me all about it in the comments below! Sounds like my kind of place Becky!!! Photos are terrific for giving a flavour of the evening. It was lovely that you could share it with Jeroen’s Mum and Dad. Next Next post: Tree Magic – Book Review!